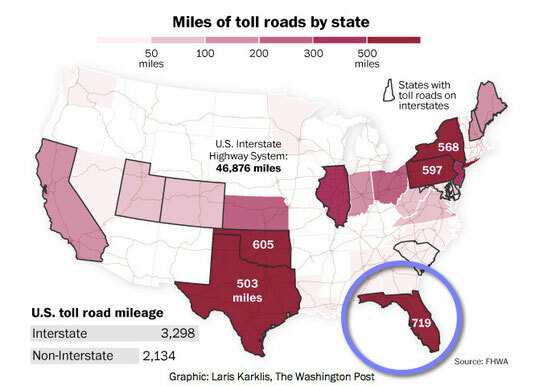 Did You Know Florida Has More Miles of Toll Roads Than Any Other State? If you're like millions of travelers across the globe who are planning a trip to the sunshine state this winter be prepared to set aside some vacation funds for tolls as Florida has over 700 miles of toll roads, more than any other state in the US. It also has a growing number of cashless tolling gantries meaning you'll either need to purchase a transponder to drive on those toll roads or be prepared to pay the services fees to cover the costs of billing through the mail. 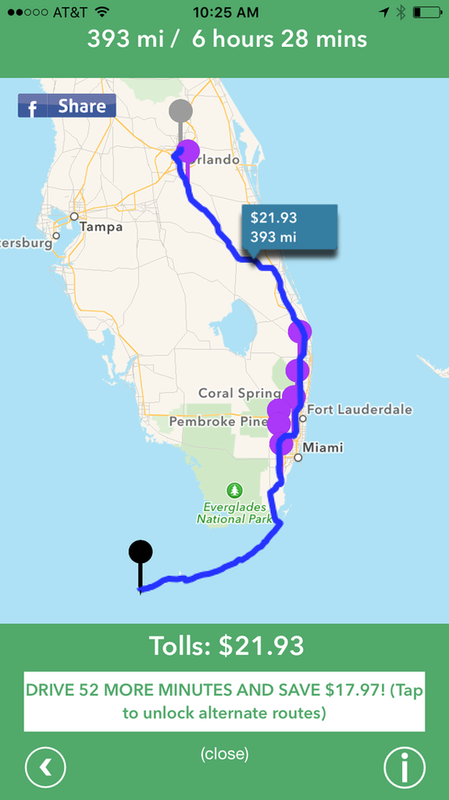 To help plan your trip to Florida and navigate the tolls once you're there we've created this Florida Tolls Survival Guide to make you smarter during your Florida vacation. To prepare yourself for the tolls you'll encounter while vacationing in Florida, below is a list of some of the major toll roads and bridges along with links to maps displaying where they are located and current toll rates so you can factor them into your travel planning. Florida Turnpike - Mainline: This is the major toll road cutting through the heart of Florida from northwest of Orlando running southeast to below Miami. Florida Turnpike - Homestead Extension: This toll road cuts around Miami connecting Interstate 95 in the north to Homestead south of Miami. Alligator Alley: This toll road cuts a direct line across the state connecting east and west coasts with Naples in the west and Ft. Lauderdale in the east. Seminole Expressway: In the Orlando region, this toll road runs north and south from the Seminole County line to Interstate 4 in Sandford, FL. Veterans Expressway & Suncoast Parkway: These connected toll roads in the Tampa area run north from downtown Tampa to US 98 in Hernando County. Polk Parkway: Connects major Polk Counties cities to each other and to Interstate 4 east of Tampa. Sunshine Skyway Bridge: Spans Tampa Bay connecting St. Petersburg, FL to Terra Ceia, FL. Mid-Bay Bridge: Spans the Choctawhachee Bay connecting Niceville, FL to the Gulf of Mexico beaches of Destin, FL. Pinellas Bayway Bridges: A series of bridges south of St. Petersburg, FL connecting the mainland to the outer islands. Garcon Point Bridge: Near Pensacola in the panhandle of Florida this bridge spans the East Bay. CASHLESS TOLL BOOTHS: Florida was one of the first states to introduce cashless tolling, and as more and more of Florida's toll roads switch to this faster and more efficient method of tolling, you'll want to be aware of when you'll encounter these toll roads so you don't end up surprised to arrive back home and find a bill awaiting you from the Florida Turnpike Authority. Here's a list of the current cashless toll facilities in Florida. Florida Turnpike - Mainline: There are currently five all electronic (cashless) toll booths on the southern end of the Florida turnpike in the Miami area. Sawgrass Expressway: This expressway west of Ft. Lauderdale has two cashless gantries, one located at each end. Veterans Expressway: There are two cashless gantries on the Veterans Expressway north of Tampa. I-4 Connector: This all electronic toll road connects Interstate 4 with the Selmon Expressway west of Tampa, FL. Additional cashless booths will be going up across Florida so to get the latest information visit the Florida Turnpike Enterprise website. If you're planning on flying into Florida for your vacation and renting a car from an agency that provides a SunPass transponder, you may feel you're covered when it comes to tolls, however there are some things you should be aware of. Many a Florida vacationer has returned home thinking they've covered all their holiday expenses, only to end up unpleasantly surprised when they receive additional charges on their credit card for service fees related to tolls. Some rental car agencies have given themselves a bad name by charging what many feel to be excessive fees related to the use of a transponder or for missed tolls, and by burying the cost of these fees in the small print of the agreement. In fact it's gotten so bad that a number of class action suits have been filed, and most recently the New York City Controller has released a report on the topic and is encouraging legislatures to regulate the behavior. Before you reserve your rental car, make sure you read the clauses related to service fees associated with tolls and the use of an agency-provided transponder, but to provide you with some guidelines below is a list of agencies that operate in Florida along with their standard services fees associated tolls. SHOULD I GET A SUNPASS? For peace of mind, and to save some money while traveling in Florida, you should definitely consider purchasing a SunPass transponder. The Florida Dept. of Transportation makes it really easy to order one by mail on the SunPass website, and at only $4.99 you'll likely recover the purchase price from the discounts you'll receive (note that this price is for the SunPass Mini Sticker Transponder that you'll affix to your windshield). 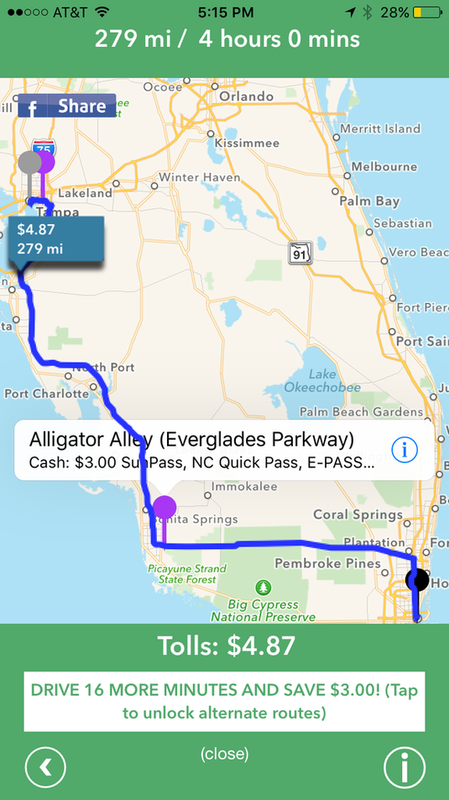 Toll Costs: Tollsmart works like Google Maps but with tolls, so simply enter that starting and ending location and the Tollsmart for app will calculate the cost of tolls, and let you know how much you'll save using a transponder like Florida's SunPass. 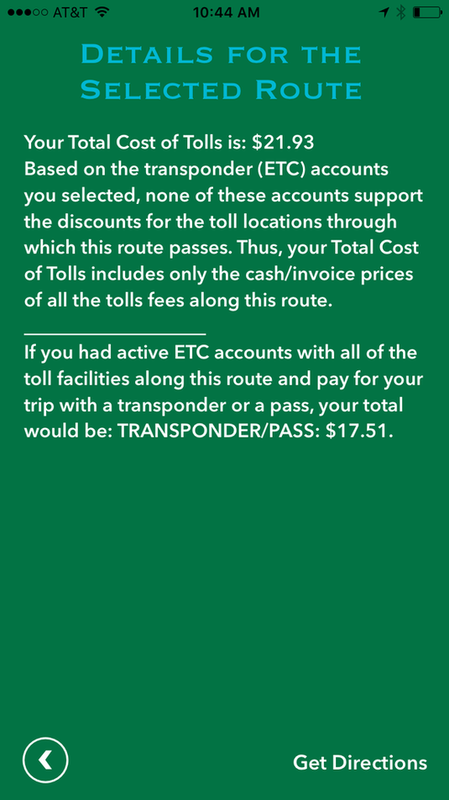 Robust Toll Information: Tollsmart also provides robust information about each tolling facility you'll encounter on your trip, including the method of payment accepted and when you'll encounter all-electronic (cashless) toll plazas. It also informs you of where your transponder is (or isn't) accepted. Cheaper Routes: The Tollsmart app will also let you know when it's found cheaper routes that will save you money, and display the additional driving time and distance so you can make a fully informed decision on which route to take. 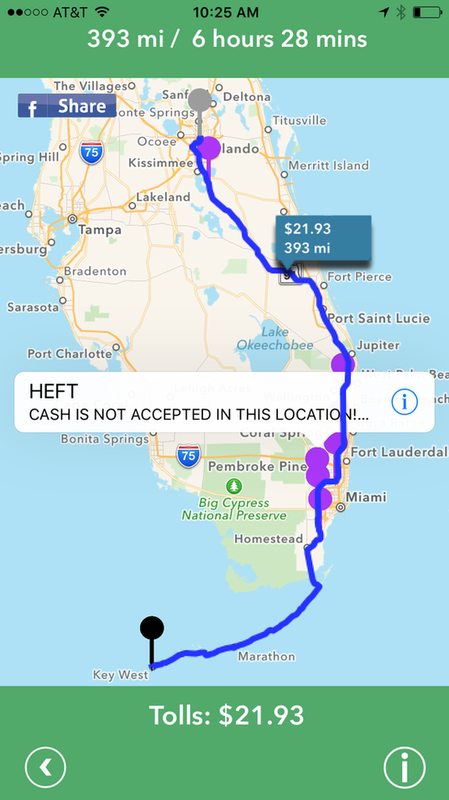 Toll Tracking: Renting a car but want to keep the rental car agency honest? Tollsmart has a toll tracking service that tracks all the tolls your drive through so you can reconcile it with your rental car bill.